‘O ye who believe! fear Allah; and let every soul look to what it sends forth for the morrow. And fear Allah; verily Allah is Well-Aware of what you do. Generally speaking the root cause of every badness or sin lies in not making any effort to avoid it by considering such action unnecessary, although this very carelessness leads to bigger sins. Man gradually forgets virtues and the standards that are expected of a believer. Fear of God diminishes and one’s belief in the Hereafter also weakens. In practice one becomes distant from the requisites of faith. The aforementioned Quranic verses draw attention to this subject. One is reminded not to merely be concerned with the interests, comforts and connections of this world. One’s main concern should be the afterlife, one’s level of faith and adopting righteousness. Accountability in the Hereafter should be pivotal to one’s concerns and this alone will lead to true moral development. One will progress spiritually when one will be conscious of what one sends forth for the morrow. This needs to be understood and appreciated. One should abide by righteousness and keep an eye on one’s practices and keep those matters in view which will adorn one’s morrow and not consider this world as everything as non-believers do. Hazrat Khalifatul Masih I (may Allah be pleased with him) said that God has given us a principle to succeed in this world and the next and that is to be concerned for the next life. This principle adorns one’s life in this world as well as the next world. In order to prepare for the Hereafter one has to start here and now. The aforementioned verse 59:19 is one of the Quranic verses recited at the time of nikah. It is the last of the verses of nikah sermon. In the nikah sermon God draws attention to many aspects; to care for familial relations, to adopt honesty enabling one to practice virtues and fulfil relationship dues, to adopt commandments of God and His Messenger and furthermore emphasis is given that if one keeps the next life in view one will also have commandments of God and His Messenger in view. There are numerous commandments of God and His Messenger which help make family/married life most pleasant. One’s family life in this world becomes paradise-like as well as one also hopes to get blessings in the next life owing to one’s good practices. This is not limited to one’s own self. Rather the blessings are far-reaching and one’s children also become recipients. If families that ruin their home lives over small, trivial matters reflected on commandments of God and also practised them, not only would they be guarantors of peaceful family life they would also be adorning the future of their children. Families that are ruining their homes over trivial worldly matters should reflect and ponder over this. Your next generation does not only belong to you, it is also an asset of the Jama’at and the nation. It is the responsibility of the parents to show their children the right way and this can only be possible when the parents follow the commandments of God and His Messenger. God has drawn the attention of every believer to this aspect. There are numerous occasions in our lives when we do not abide by righteousness and do not keep the Hereafter in view. Imperceptibly we give preference to worldly supports over God’s support. Due to our ineptitude and failings we ruin our future in this world and also disregard the next life. Hazrat Khalifatul Masih (may Allah be pleased with him) said that a believer should first think of the consequences of any task that he embarks upon. When enraged man is given to murderous tendencies and is also verbally abusive. But he should reflect over the consequences of this conduct. Reflecting over the consequences will lead him to abide by righteousness. All badness or evil stems from the fact that we have Satan in our thoughts/mind and we do whatever we do without giving any thought to the consequences of the matter. Here, the reference is not to those who are habitual in wrongdoing or those who have no control over their actions. Rather, here those people are meant who claim to have faith. Hazrat Khalifatul Masih I (may Allah be pleased with him) said that one should have faith that God is watching over whatever one does. If man believes that the one who rules over/governs him is all-knowing and all-aware who watches over every kind of wickedness, ineptitude and sloth and would punish, man can avoid punishment by taking due action. This is the kind of faith one should instil. If one does not undertake tasks with probity even in worldly matters one’s earnings are not acceptable and above-board. The verse (59:19) drawing attention to one’s morrow has great extensive meanings and significance. We need to instil the belief that God watches every act of ours and we also need to instil the belief that every kind of deception, no matter how insignificant we may consider it to be, or any sloth or indolence on our part is not liked by God. By asking believers to look for what one sends for the morrow God has commanded us to abide by righteousness in family matters, in business matters to matters of national and international scope. Man may think that worldly matters have no connection with faith but a believer is asked to abide by righteousness. At times people take certain steps in order to avoid worldly loss but it should be remembered that any step that is advantageous through deception distances one from faith and belief. And gradually one drifts away from religion and God. Thus one should have in view the consequence of everything one does as God watches over everything that we do. For this purpose one does not need to look at any questionnaire/form of one of the auxiliary organisations. In fact we should hold ourselves accountable on a personal level. If we do something with good intention and do it to seek the pleasure of God then we have the promise of multiple rewards from God. If our intention behind doing something is not so good we should be aware that we can come under Divine chastisement. If everyone fulfils their obligations with these thoughts the general level of righteousness in the Jama’at will enhance and it will be evident for all to see. Neither the department of Tarbiyyat will be involved in this not the office of Amoore Aama or any other department. Thus we should continuously look into ourselves and make endeavours to safeguard ourselves against satanic attacks. Indeed, the Holy Prophet (peace and blessings of Allah be on him) said that Satan flows in the veins of every person like blood adding that the Satan in his blood stream had become Muslim. When we are unwell we may catch an infection which enters our blood stream. Initially we are not even aware of the illness and at times even doctors cannot pinpoint an illness that has entered our blood stream and is at an early stage. There are viruses abound as we see these days there is widespread illness. However, the most dangerous ailment these days is spiritual ailment which is rampant. Man does not even know when and how Satan enters the blood stream. At least with physical ailment one feels some symptoms and is alerted and seeks medical help. However, this is not so with spiritual ailment. One’s near and dear ones notice signs of spiritual ailment and try and advice one. Those who have reached later stages of spiritual ailment consider the advice of their near and dear ones as erroneous. Indeed satanic attacks and spiritual ailments are far worse and far more dangerous than physical ailments because man is not prepared for the cure. This is why true believers should take precautionary measures before any such attack can take place. We need constant practice and remedy in order to safeguard because spiritual ailments are rampant. We should remember that a true believer is never without fear of God. When the Holy Prophet (peace and blessings of Allah be on him) awoke during night he would pray and supplicate with great humility and tenderness of heart. Hazrat ‘Aishah (may Allah be pleased with her) put it to him that God had indeed granted him forgiveness why then did he supplicate so humbly. 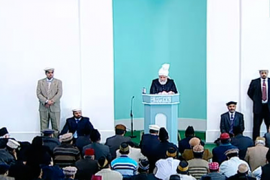 The Holy Prophet (peace and blessings of Allah be on him) replied that his salvation was but with the grace of God and he needed to ever turn to God. Now, if someone like the Holy Prophet (peace and blessings of Allah be on him) practised so much humility and fear of God, who can say that he is not in need of looking for God’s blessings! We need to be constantly alert, we need to constantly abide by righteousness, we need to constantly self-reflect, we need to constantly seek God’s mercy and we need to constantly be mindful how to safeguard our faith as explained in verse 59:20. The spiritually ill do not deem themselves as ill. In fact when their sympathisers try and make them better they think it is the sympathisers who are not well. This results in nothing but ruination. Generally speaking man forgets God in three ways. Firstly, those who do not believe in the existence of God and there is a large number of people these days who do not. These people are apparently educated and use the media and the internet to poison the minds of the young and the vulnerable. Secondly, those who do not have true belief in an All-Powerful God. These people do believe in the existence of God as the Creator and believe that the entire cosmos operates with God’s power. Thirdly, it is those who are so immersed in worldly matters that they have forgotten God. They may offer Salat or pray when they remember but are not focussed that Salat is obligatory for true believers. Those who forget God ultimately reach a stage of moral and spiritual decline and have no inner peace. They are very prompt in identifying worldly comforts and God makes them forgetful towards Him. Righteousness demands one to lead life in accordance with the commandments of God and this includes looking at the consequence of everything one embarks upon and having firm belief that God is watching over everything one does. When Hazrat Khalifatul Masih visited Kenya he met with a politician who related to him that he had also met Hazrat Khalifatul Masih IV (may Allah have mercy on him) who had advised him something which had proved very beneficial. The advice was to think before doing anything that God is watching you and that He also has a record of everything one does. Perhaps this person was Christian. If he could benefit from this advice, how much more beneficial would the advice be for a true believer who has been enjoined by God to follow it. If one forgets God one is included among the rebellious. The verse makes it very clear that if you do not abide by righteousness, are not concerned about your next life and do not follow God’s commandments you will be among the rebellious. And the rebellious are those who break the limits set by God, who are embroiled in sins, who are flagrant about obedience and who are distant from honesty. It is a cause for great concern if we do not self-reflect. Hazrat Khalifatul Masih I (may Allah be pleased with him) said do not be like those people who abandon the Fountain-head of all purity that Holy God is and wish to succeed through mischievous plans and scheming. Indeed, man is faced with many problems in life but the glory of a righteous person is in never letting any perversion enter in his connection with God. We should never let go of our connection with God Who does not separate from us in life and in death.